While you snuggle up by the fire on cold Winter nights where is your pet? With a few considerations you can be sure that it too is warm and dry. Is your pet's fur enough to keep it warm? In most cases dogs and cats will not remain dry to the skin unless they have shelter. Wet animals will become chilled, especially if the winds are cold. Has your pet got shelter from rain and cold? 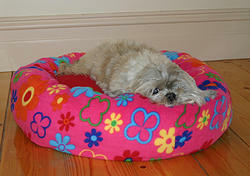 Dogs and cats should have a cosy bed protected from wind and weather. While there are some excellent kennels available for dogs and cat houses for your puss, it is possible to construct a warm bed on a budget. A box is ideal to provide this protection. The principles to remember are keep the bed off the ground, prevent draughts, face it away from prevailing winds and provide plenty of clean, warm bedding to snuggle into. Are you a winter-time couch potato? It can be tempting to stay by the fire on winter days, but it is important for you and your pet to maintain a regular exercise routine throughout Winter. Remember to dry the dog if it becomes wet from walking in the rain. You could consider purchasing a coat for your dog to help keep it dry during winter walks. Coats come in a great array of colours and styles, from knitted to oilskins, but it is important to make sure the coat is the correct fit. 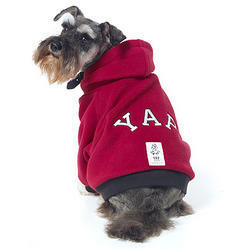 To measure for a coat it is necessary to have the dog standing properly. Take an exact measurement from where the collar sits naturally on the back of the neck, down to the base of the tail. The girth of the coat is generally proportional to the length but to measure this (important for large thickset dogs) measure around the body just behind the elbows. Take your measurements along to your local pet store and check out the fashions! If your pet is getting on in years you may find it slows down during Winter and is reluctant to get out of bed and stiff when it moves. This is usually a sign of arthritic changes that may occur in the elderly pet. Your vet may recommend medication to ease your pet's discomfort and advise you on ways of helping your old friend through the Winter.